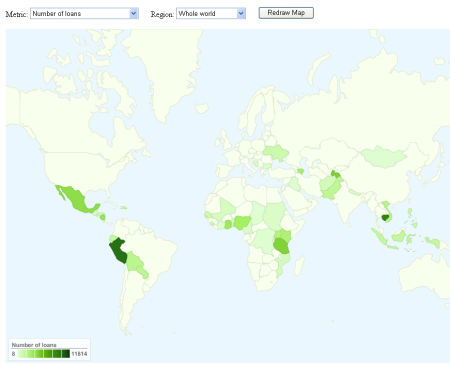 The Kiva API allows anyone to develop applications that use the data from Kiva loans. 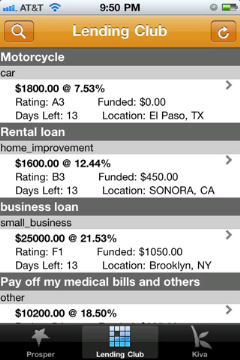 Below are screenshots from two Kiva loan apps. Just a short heads up: Kiva plans a developer program allowing 3rd party applications to use data from the Kiva (lender) pages. We’ve been working hard over the past few months to create a developer program at Kiva. This will be a place online where software engineers can get creative with Kiva and build applications that use Kiva in new ways. Perhaps someone will build a spiffy new tool to help you make a loan on your iPhone, or a text messaging service that notifies you when loans from your favorite country are available. A Facebook application that helps you keep up with new journals from your loans and share them with friends would be handy too. MyC4.com accelerated growth during the past month. 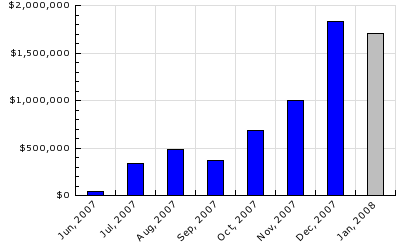 This is shown by stats on MyC4Stats.com (provided by Wiseclerk.com) showing the loan volume by origination month. Compared to earlier months the loan volume rose sharply in December and January. In December 150,000 Euro loans and in January 250,000 Euro loans were disbursed to African entrepreneurs. 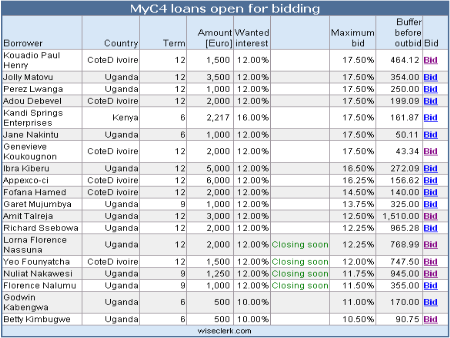 The new MyC4Stats page offers reports helping lenders to find open MyC4 loan listings with the best rates. At MyC4 – unlike at Prosper – every lender funds a loan at his individual interest rate. In fact 50 different lenders funding one specific loan may each earn different, self-set interest rates. While MyC4 sets a maximum for the weighted average interest rate for each loan, it is still possible for an individual lender to bid higher and earn more after funding. Example: A 2500 Euro loan to Clementine Gbrou, who exports grains to Europe the maximum weighted Wanted interest rate was 12% (lender interest, not borrower). This loan closed with a weighted average interest rate of 11,64% (lender interest). The individual lenders in this loan earn DIFFERENT selfselected interest rate between 3% and 13.5%. Several lenders thus achieved above average rates. How to find the best loans? The report presents the listings sorted by maximum interest rate (column Maximum bid) that can be bid and states the Euro amount above this rate that serves as a buffer before being outbid. The buffer is caused by the rule that new bids must always be place at least 0.5% lower then the current high bid.